DALLAS, TX The Rev. Dr. Christopher D. Girata, Rector of Saint Michael and All Angels Episcopal, will moderate a discussion centering on love and reconciliation. These two topics play a primary role in the platform and priorities of both the Archbishop and Presiding Bishop. The talk will touch upon the evidence of global need, the responsibility we, as Christians, each share in the way of Jesus, and what intentional actions of love and reconciliation might look like in today’s world. This is a historic moment as it will be the first time these two leaders have met with one another on American soil since they have both been in office. The descendant of enslaved Africans brought to North America by way of the trans-Atlantic slave routes, Presiding Bishop Curry was born in Chicago, IL, on March 13, 1953. Presiding Bishop Curry’s father was an Episcopal priest and his mother was a devout Episcopalian. She died at a young age, and Presiding Bishop Curry, along with his sister, was raised by his father and his grandmother. His father, mother and grandmother grounded him in Christian beliefs and practices through their example and their teachings. He attended public schools in Buffalo, NY, and, even at a young age, he learned about social activism through his father’s leadership and his own dedication to righting a broken world. Presiding Bishop Curry was graduated with high honors from Hobart College in Geneva, NY, in 1975. He received a Master of Divinity degree in 1978 from Yale University Divinity School in New Haven, CT. He has furthered his education with continued study at The College of Preachers, Princeton Theological Seminary, Wake Forest University, the Ecumenical Institute at St. Mary’s Seminary, and the Institute of Christian Jewish Studies. He has received honorary degrees from Episcopal Divinity School; Sewanee: The University of the South; Virginia Theological Seminary; and Yale. The Friends of the Anglican Centre in Rome are men and women, priests and lay people, the newly curious as well as committed ecumenists, young, old and everything in between. 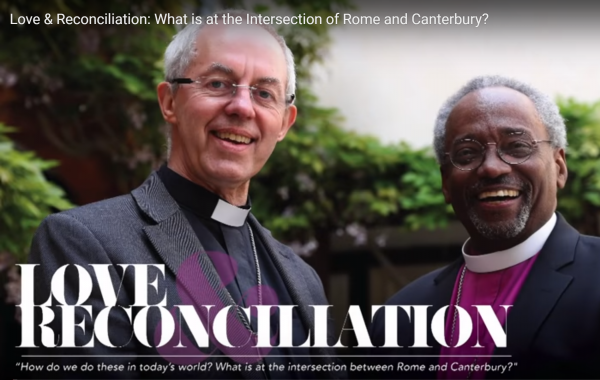 We hold a diversity of views on social, political, and theological positions, and have many different ways of trying to understand unity between the Anglican Communion and the Roman Catholic Church. Most of all, each and every one of us is committed to a dialogue between our churches that is never dull, that is alternatively frustrating and rewarding, and that’s always worth the effort. The Rev. Dr. Chris Girata was called to be the eighth Rector of Saint Michael and All Angels in June, 2016 and started his ministry at Saint Michael on August 15, 2016. Previously, Chris served as Rector of Calvary Episcopal Church in downtown Memphis, Tennessee, a position he had held since 2012. Prior to becoming rector at Calvary, he was Associate Rector at St. Luke’s in Birmingham from 2008 – 2012, and as a seminarian served at The National Cathedral in Washington, D.C., and at St. John’s in Chevy Chase, MD. He is recognized as a leader in the Episcopal Church, presenting regularly at church-wide conferences, seminars and retreats, and the Consortium for Endowed Episcopal Parishes. Chris is a native of Florida, a classically trained musician, and an amateur cook. He and his wife, Nicole, have three children. Just south of Northwest Highway off of Douglas Avenue, Saint Michael and All Angels is all about people—people who care for one another. People who learn and share experiences together. People who believe that we can make a difference in our community—around the world—and in our individual lives. We are a vibrant Episcopal Church started in 1945 in a Boy Scout hut located on the grounds of the University Park YMCA. Several months later, on the Feast Day of Saint Michael and All Angels, the group, which by then had become several hundred persons, executed the charter and formed Saint Michael and All Angels Episcopal Church. Today our community is one of the largest in the country, seeking to help those around us in need, and deepening our personal faith in a pursuit of Jesus Christ.